Beth-Ann Ryan of the Delaware Division of Libraries has been named a “Mover and Shaker” in the library industry by the national publication, Library Journal. In its March 15, 2016 issue, Library Journal named 54 outstanding professionals committed to providing excellent service and shaping the future of libraries. 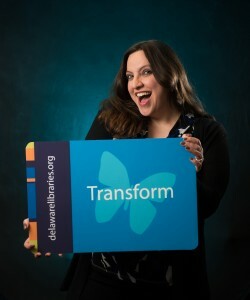 Beth-Ann was selected because of her commitment to the profession and her work on maximizing the statewide technology infrastructure (the Delaware Library Catalog), applying a library assessment logic model (Dewey Delaware), and creating the Inspiration Spaces in Delaware Libraries. Beth-Ann currently serves as the Deputy Director of the Delaware Division of Libraries. She has presented nationally on the power of training, technology, data and collaboration to drive success. Library Journal honored Beth-Ann because of her work in harnessing technology to maximize strategic partnerships. “This year’s class of 54 joins a group of talented professionals who are committed, passionate, and invigorated—each alone and all together transforming the library world and the communities it impacts for the better,” said Rebecca T. Miller, Editorial Director of Library Journal and School Library Journal. “Using her technology savvy, Beth-Ann fast-tracked implementation of numerous technologies among libraries statewide. Delaware is the First State, and thanks to Beth-Ann we can be proud of being the first state to maximize a robust statewide library technology platform,” said State Librarian, Dr. Annie Norman. Beth-Ann has been with the Delaware Division of Libraries since 2008, and has served as Deputy Director since 2011. She received a BA in Sociology and English from the University of Connecticut in 2000, an MLS from the University of Maryland in 2005 and Certification in Social Media Strategy from the University of Delaware in 2013. The 2016 Movers & Shakers were selected by the editors of Library Journal, the profession’s leading trade magazine. Each of the Movers & Shakers will be prominently featured in the March 15th issue of Library Journal and celebrated at a special reception in June during the American Library Association’s annual conference in Orlando, FL. The print feature’s companion website is sponsored by OCLC and available at www.libraryjournal.com/movers2016. The Delaware Division of Libraries, a state agency dedicated to unleashing the potential in all Delawareans in partnership with Delaware Libraries, offers free access to the online catalog (delawarelibraries.org); Wi-Fi; computers/internet; eBooks, programs/classes, community partnerships, and more. Founded in 1876, Library Journal is one of the oldest and most respected publications covering the library field. Over 75,000 library directors, administrators, and staff in public, academic, and special libraries read LJ. Library Journal reviews over 8000 books, audiobooks, videos, databases, and web sites annually, and provides coverage of technology, management, policy, and other professional concerns. For more information, visit www.libraryjournal.com. Library Journal is a publication of Media Source Inc., which also owns School Library Journal, The Horn Book publications, and Junior Library Guild.